Spondylolysis and spondylolisthesis are conditions affecting the facet joints that align the vertebrae one on top of the other. Spondylolysis is a weakness or stress fracture in the facet joint area. This weakness can cause the bones to slip forward out of normal position, called spondylolisthesis, and kink the spinal nerves. Treatment options include physical therapy to strengthen the muscles. A back brace may be used to support the spine. In some cases, surgery can realign and fuse the bones. Your spine is made of 24 moveable bones called vertebrae that provide the main support for your body, allowing you to bend and twist. Each of the vertebrae are separated and cushioned by a gel-like disc, keeping them from rubbing together. The vertebrae are connected and held to each other by ligaments and joints, called facet joints (see Anatomy of the Spine). 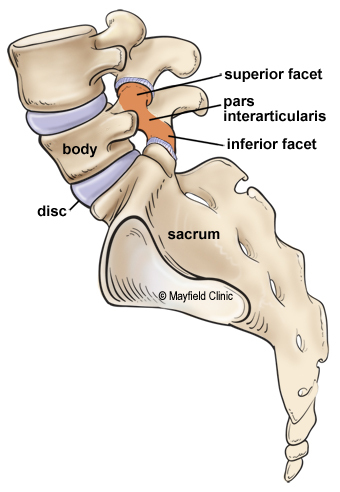 The upper facet joint and the lower facet joint are connected by a narrow bridge of bone called the pars interarticularis (Fig. 1). The inferior facet of one vertebra fits perfectly into the superior facet of the one below it – overlapping like shingles – beginning with the vertebra at the base of your skull and ending at your tailbone. Figure 1. The superior and inferior facets articulate together to form a facet joint. Each vertebra has two facet joints, one pair that connects to the vertebra above (superior facets) and one pair that connects to the vertebra below (inferior facets). The thin bridge of bone between the superior and inferior facets is called the pars interarticularis. Spondylolysis (spon-dee-low-lye-sis) and spondylolisthesis (spon-dee-low-lis-thee-sis) are separate, yet related conditions. Spondylolysis usually comes first, though not always. The term comes from "spondylo," which means spine, and "lysis," which means to divide. Spondylolysis is a breakdown or fracture of the narrow bridge between the upper and lower facets, called the pars interarticularis. It can occur on one side (unilateral) or both sides (bilateral) and at any level of the spine, but most often at the fourth or fifth lumbar vertebra (Fig. 2). If spondylolysis is present, then you have the potential to develop spondylolisthesis. Figure 2. 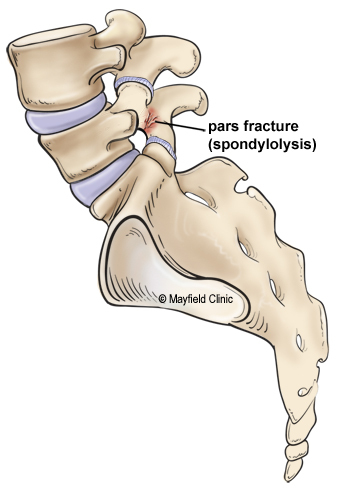 Spondylolysis is a breakdown or fracture of the pars interarticularis. 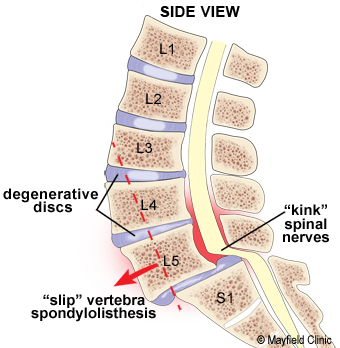 Spondylolisthesis is the slipping forward of the vertebral bone. The term "listhesis" means to slip forward (Fig. 3). It occurs when the weakened pars interarticularis separates and allows the vertebra to move forward out of position causing pinched nerves and pain. Spondylolisthesis usually occurs between the fourth and fifth lumber vertebra or at the last lumbar vertebra and the sacrum. This is where your spine curves into its most pronounced "S" shape and where the stress is heaviest. Figure 3. Spondylolisthesis is the forward slippage of a vertebra out of its normal position caused by a pars fracture. The facet joint is no longer able to hold the vertebra in place against the ever-present downward force of body weight. Slippage is measured on a scale from grade 1 slippage (25%) to grade 4 (100%). The more the lower back curves in (swayback or lordosis), the steeper the grade. Mild cases of spondylolysis and spondylolisthesis usually cause minimal pain. In fact, the conditions are often found by accident when a person has an X-ray of the back for an unrelated reason. When spondylolysis and spondylolisthesis do cause pain, you may experience low back pain, stiffness, and muscle spasms. You may also have sciatica (pain radiating down one or both legs), or numbness, though this is not common. Leg pain will usually be worse when you stand or walk. The amount of pain you have depends on how fast your vertebrae are slipping. If you have very subtle symptoms, you may only feel tightness in your hamstrings or find that you can no longer touch your toes, but not feel any nerve pain. Spondylolisthesis is most often caused by spondylolysis. The cause of spondylolysis is not as clearly defined. Most believe it is due to a genetic weakness of the pars interarticularis. Both spondylolysis and spondylolisthesis can be present at birth or occur through injury. Repeated stress fractures caused by hyperextension of the back (as in gymnastics and football) and traumatic fractures are also causes. The most common cause in adults is degenerative arthritis. Those who play sports, especially gymnasts and football players, are more likely to have spondylolisthesis. The condition most often affects people over 40 years of age. About 5% of Americans have this structural deficiency and don't know it. Just because it appears on an X-ray doesn't mean you'll have pain. When you first have pain, consult your family doctor. They will take a complete medical history to understand your symptoms, any prior injuries or conditions, and determine if any lifestyle habits are causing the pain. Next a physical exam is performed to determine the source of the pain and test for muscle weakness or numbness. X-rays view the bony vertebrae in your spine and can tell your doctor if any of them are too close together or whether you have arthritic changes, bone spurs, fractures, or any slippage of the vertebrae (Fig. 4). Figure 4. 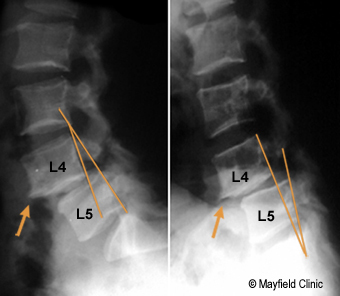 X-rays show spondylolisthesis at the L4-L5 vertebral level. The degree of slip varies when the spine is extended (left) or flexed (right). Magnetic resonance imaging (MRI) scan is a noninvasive test that uses a magnetic field and radiofrequency waves to give a detailed view of the soft tissues of your spine. It may or may not be performed with a dye (contrast agent) injected into your bloodstream. An MRI can tell your doctor where your spine is damaged and if there is any nerve compression. It can also detect bony overgrowth, spinal cord tumors, or abscesses. Computed Tomography (CT) scan is a safe, noninvasive test that uses an X-ray beam and a computer to make 2 dimensional images of your spine. It may or may not be performed with a dye (contrast agent) injected into your bloodstream. Single Photon Emission Computed Tomography (SPECT) scan is a test to analyze blood flow to an area of the body. A small amount of radioactive tracer is injected into a vein. As the tracer circulates in the blood, it is absorbed by the tissues and then gives off energy. The energy is seen by the CT scanner and can detect stress fractures, spondylolysis, infection, and tumors by the differences in how the radioactive substance is absorbed by normal healthy tissue vs. diseased tissue. First, athletic activity should be stopped to allow the fracture to heal. Conservative nonsurgical treatment is the first step and may include medication, rest, physical therapy, home exercises, hydrotherapy, a brace, and pain management. Periodic x-rays will allow the doctor to watch the degree of slippage. Surgery may be needed if slippage continues or if your pain is not relieved by conservative treatment. Self care and braces: Using correct posture (see Posture & Body Mechanics) and keeping your spine in alignment are the most important things you can do for your back. The lower back (lumbar curve) bears most of your weight, so proper alignment of this section can prevent further slippage and injury to your spinal nerves and discs. You may need to make adjustments to your daily standing, sitting, and sleeping habits. You may also need to learn proper ways to lift and bend (see Self care for Back Pain). You may need to wear a back brace for a short period of time while you strengthen the abdominal and lower back muscles. The brace may decrease muscle spasm and pain as well as help immobilize your spine and help the healing process. Your doctor may refer you to an orthotist who specializes in custom-made braces. Physical therapy: The goal of physical therapy is to help you return to full activity as soon as possible. Exercise is very helpful for pain and it can help you heal faster. Physical therapists can instruct you on proper lifting and walking techniques, and they'll work with you to strengthen your abdominal muscles and lower back (see Back Stretches & Strengthening). They'll also encourage you to increase the flexibility of your spine and legs. Medications: Your doctor may prescribe pain relievers, nonsteroidal anti-inflammatory medications (NSAIDs), and steroids. Sometimes muscle relaxers are prescribed for muscle spasms. Analgesics, such as acetaminophen (Tylenol), can relieve pain but don't have the anti-inflammatory effects of NSAIDs. Long-term use of analgesics and NSAIDs may cause stomach ulcers as well as kidney and liver problems. Steroids can be used to reduce the swelling and inflammation of the nerves. They are taken orally (as a Medrol dose pack) in a tapering dosage over a 5-day period. They have the advantage of providing pain relief within a 24-hour period. Epidural steroid injections: An injection of corticosteroid and a numbing agent is delivered into the epidural space of the spinal canal or nerve root canals to reduce the swelling of the nerves. Facet injections: An injection of corticosteroid and a numbing agent is delivered directly into the painful facet joint. Holistic therapy: Some patients find that acupuncture, acupressure, yoga, nutrition / diet changes, and biofeedback are helpful in managing pain as well as improving your overall health. If slippage continues or if your pain doesn’t respond to conservative therapy, surgery may be needed to realign the bones. Spinal fusion can address both the instability of the spine and compression of the nerve roots. The surgeon first performs a laminectomy to decompress the nerves. Then a bone graft is inserted into the disc space to “shim” the angle of the slipped vertebra. 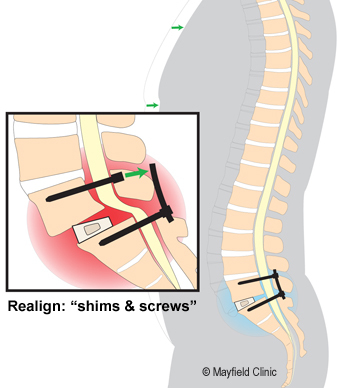 Pedicle screws are inserted into the bones above and below the slip. Then the surgeon leverages the screw to pull the bones back into alignment and secures it with a rod (Fig. 5). Over the next 3 to 6 months new bone will grow across the graft, permanently joining the two pieces of bone (Fig. 6). Fusion is successful in 90% of cases because it stops the instable motion and keeps your spinal canal from narrowing further. Figure 5. Spinal fusion uses a wedged bone graft to "shim" the top vertebra while screws are used to pull the bones back into alignment on top of each other. Figure 6. X-ray at 3 months shows the bone graft has fused the two vertebrae into one solid piece of bone. lordosis: increased curvature of the normally curved lumbar spine that tends to make the buttocks more prominent. 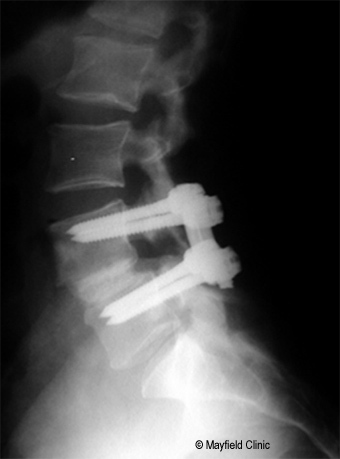 We treat more than 600 patients with spondylolisthesis each year. "I decided on the minimally invasive surgery with Dr. Kachmann," Jan says. "I said, yes, let's do it. And it was the best decision I have ever made." In this webinar, Dr. William Tobler explains minimally invasive spine fusion surgery.